I'll be honest - I don't read too many blogs. I have a hard enough time staying on top of current events, tech news, not to mention my full time job as a technology integration specialist. However, I have found a passion for writing through this blog over the past few months, and I do find value in reading several other sources for ideas, inspiration, and creativity. So, on a day of giving thanks, I'd like to nominate the following for the 2010 EduBlog Awards. Love the magazine, and this is a nice collaborative way to keep a blog. So good, I nominated the site twice. One stop shopping here. If I was still teaching science, I'd stay caught up with his insightful thoughts. Great resources, opportunities for PLN, and all around strong Google connection. One of the best organized and most inclusive edtech wikis I've come across. I get a lot of emails from Steve, and it doesn't make me want to unsubscribe. That should be an award on its own. Instead, we'll give him this one for all he does with C2.0, GEC, elluminate, and so much more. Receive pertinent posts about Technology for Teachers - Subscribe to Chanatown's Teacher Posts. 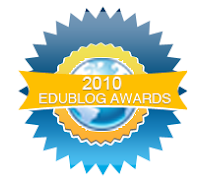 Thank you, David, for the Edublogs nomination. I appreciate your support. You're welcome Lisa, and you've got my vote - good luck, and keep up the great work.